Auria — Laguna Beach Live! Auria, “gentle music,” brings together the talents and experiences of artists who’ve performed all over the globe. Now all residing in Los Angeles, they discovered a collaboration that’s just beginning to catch the ear of music lovers across the city. Auria, “gentle music,” made its debut as an ensemble with the Southeast Symphony. Soon afterward, Auria was presented in concert by the Mid-City Music Center at the Lucy Florence Cultural Center in the heart of historic Leimert Park Village in Los Angeles. Appearances on the Laguna Beach Live! and L.A. Musical Salon Dinner/Concert Series in Westwood followed. Soprano Yolanda Mitchell West performs frequently as a soloist throughout the United States and Europe. 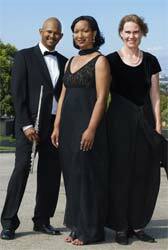 Past engagements include appearances with the Southeast Symphony, the Ventura County Symphony, the Torrance Symphony, the Marina Del Rey-Westchester Symphony, the Carson-Dominguez Hills Symphony, the South Coast Symphony Orchestra, Albert J. McNeil Jubilee Singers, The Angeles Chorale, The Camerata Singers (Monterey, CA) and the DLW Community Chorale. Her first CD, “Sweet Sweet Spirit”, a collection of art songs, arias, and spirituals was released in 2001; and in 2007 she released two CDs: “Lord, How Come Me Here?” a collection of sacred songs and spirituals and “An Afternoon of Sacred Songs, Spirituals and Arias., made from a live recording of her appearance at Holman United Methodist Church (April 1, 2007). Harpist Andrea Thiele is a native of Germany. She was principal harpist of the Phoenix Symphony from 1998-2001, the Staatskapelle Schwerin from 1994-1998 and played with the orchestras of the Hamburgische Staatsoper, Deutsche Oper Berlin, Münchner Philharmoniker, Los Angeles Philharmonic and many local L.A. area orchestras. As a soloist she performed with the Polish Chamber Orchestra, the Polish Chamber Orchestra, Warsaw Symphony, Yale Philharmonia, Phoenix Symphony, Orquestra Sinfonia Nacional of Mexico City and the Southeast Symphony in Los Angeles. She recorded at various European Broadcast Corporations as well as two solo CDs in 1998 and 2000. In 2006 Andrea released a Flute and Harp CD with her duo partner Elizabeth Buck. With one of her chamber music groups she performed at the World Harp Congress 1999 in Prague.